This is a sandwich that has it all. The sweet, hot, sour, garlic and umami ingredients in the vinaigrette atop this sandwich make a perfect ally for mint-infused beers. The cool crunch from the vegetables with the combination of the herbs creates unparalleled freshness. And, of course, the warm sirloin with the rosemary potato bread brings the savory. I suggest using a natural meat purveyor whenever possible. Make the vinaigrette up to eight hours in advance, refrigerate before serving and reserve some on the side to dip the sandwich in. 1. In a pot, bring the fish sauce, sugar and Champagne vinegar to a boil. Allow to cool. Then add the lime juice, chilies and garlic. Let sit at least eight hours or overnight. 2. In a bowl add the frisée, red mustard greens, carrot, radish, red onion, mint and cilantro. Set aside. 3. Preheat the oven to 400 degrees F. Season the sirloin with sea salt and black pepper. On the stovetop, heat a cast-iron pan over medium-high heat and sear the sirloin until browned, about 2 minutes per side. Transfer pan to the oven and cook for 4 minutes. Carefully remove and allow meat to rest for 5 minutes. 4. Slice and toast the potato bread. 5. Reserve some of the vinaigrette for later. Add the remaining vinaigrette to the bowl of vegetables and mix together. 6. Thinly slice the sirloin. Construct the sandwich by placing sirloin on bottom piece of bread. Top with vegetable and vinaigrette mixture and top piece of bread. Serve with extra vinaigrette for dipping. 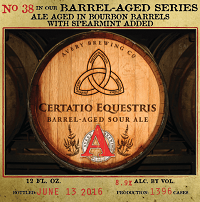 Brewers continue to experiment with specialty ingredients, pushing the boundaries of flavor. Since good beer deserves a good meal, All About Beer Magazine asked chef Patrick Feury of Nectar Restaurant in Berwyn, Pennsylvania, to taste three beers infused with mint and offer tasting notes and pairing suggestions. Get more pairing ideas and recipes at allaboutbeer.com/food. 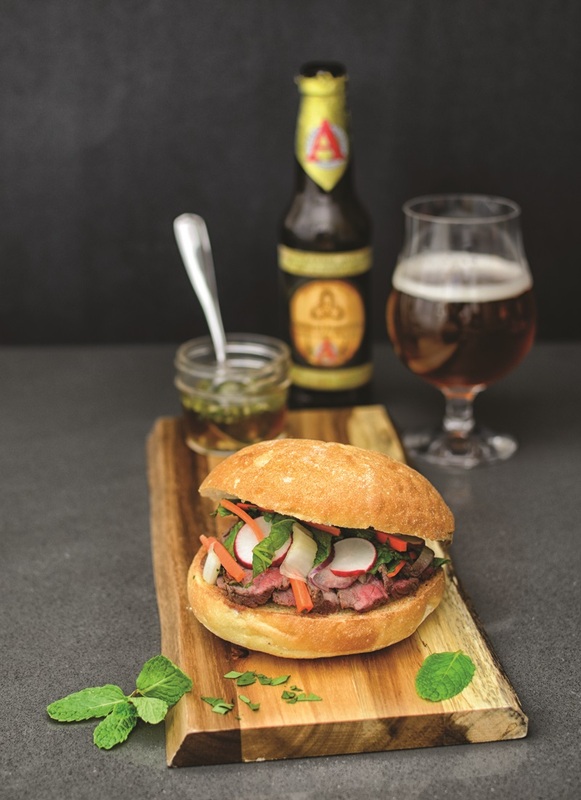 Tasting Notes: With its delightfully sour and almost tinny touch of lemon, this beer pairs perfectly with the Vietnamese Sirloin Beef Sandwich. The spearmint is assertive but not overly strong, so it matches well with the lime in the vinaigrette. A slight pucker in the finish along with a touch of natural vanilla from the barrel complement the herbs in the sandwich topping. Tasting Notes: Drinks like a true summer beer. 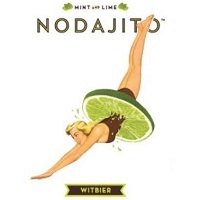 The mint character is super fresh, akin to fresh leaves muddled in a cocktail. The coriander and citrus character from the base beer rings clear with each sip, and with a pop of lime zest, this made me think of fresh sushi with a heavy dollop of wasabi. Try pairing this beer with the pad Thai of your choice. 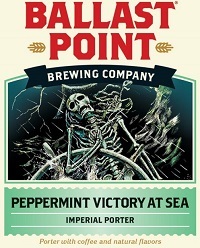 Tasting Notes: This porter is hearty and almost a meal in itself. With flavors of creamy coffee and just a splash of mint, it’s like a milkshake, but not overly sweet. Some will go the dessert route, but I suggest savory. Pair this with freshly shucked oysters or duck fat french fries. Alongside a salty gravlax it shines, or for a snack it’s well-matched with sea-salt-chocolate-covered pretzels.